Version 8.3 - To see what has changed between v7.5 & v8.3 visit here and select 'Curriculum Version History'. Reading page after page of curriculum documents presented in black and white font can inhibit one from easily understanding what a curriculum framework is about and retaining the information required to plan for effective teaching and learning. Harder yet is the task of committing to memory content descriptions contained within in a certain level description and then quickly trying to ascertain the progression from said content descriptor/standard from one page to another. The Progressive Curriculum Frameworks below are the solution to these problems. The Progressive Curriculum Frameworks are specifically designed for the 2013-2015 (v7.5) versions of the Australian Curriculum. The following Progressive Curriculum Frameworks have been designed for educators, parents and students alike to easily identify and understand progression in the expected skills and abilities of students, that are in essence, the heart of the Australian Curriculum. Progression between the statements contained in each level descriptor and standard is clearly denoted by bold text. Each year level is assigned a specific colour. The content descriptors contain the cross-curriculum priorities and general capabilities as denoted by the relevant icons. Essentially, reading each Progressive Curriculum Framework PDF reduces the need for teachers to read, re-read and compare each sentence and every word in the Australian Curriculum. 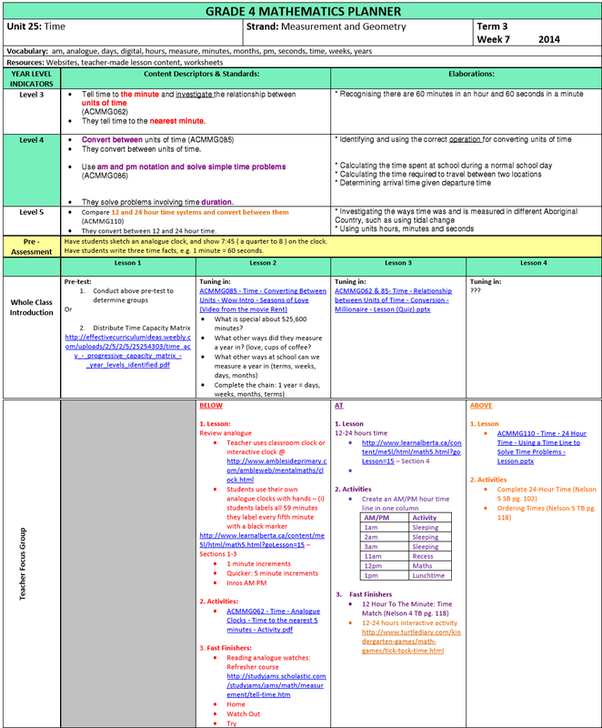 Displayed below is a screenshot of The Progressive Curriculum Framework for the Australian Curriculum - English (click/touch the image below to open up the PDF in a new window). 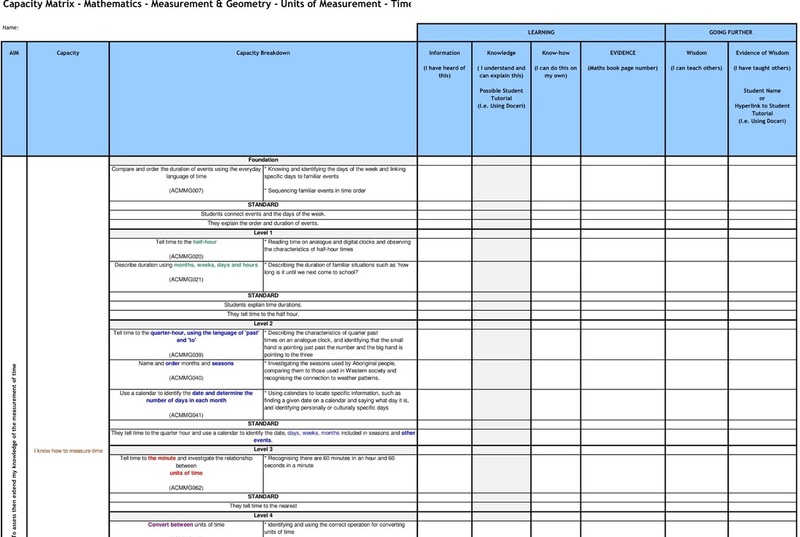 Displayed below is a screenshot of The Progressive Curriculum Framework for the Australian Curriculum: Mathematics - Number & Algebra (click/touch the image below to open up the PDF if a new window). 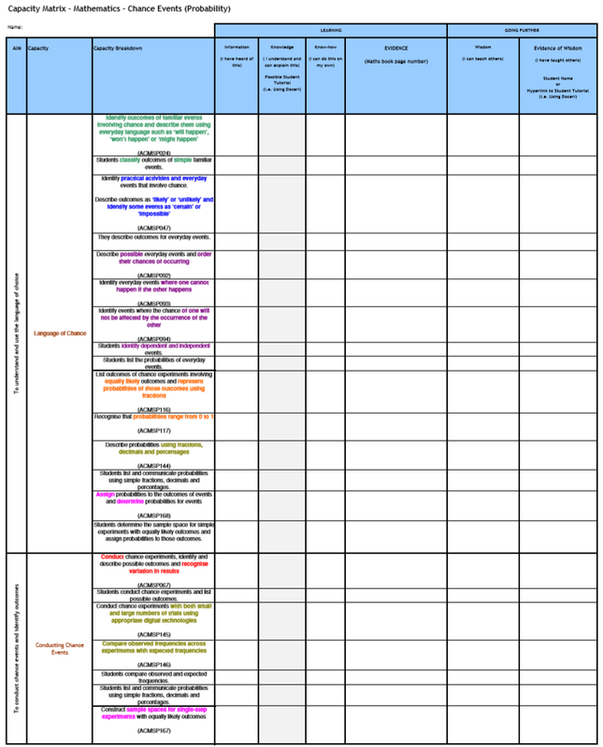 The Progressive Curriculum Frameworks are free and are currently being used and trialled in various Australian schools for a wide variety of teaching and learning practices, including for clearly demonstrating differentiation in planning documents (as pictured below - click/touch to download). 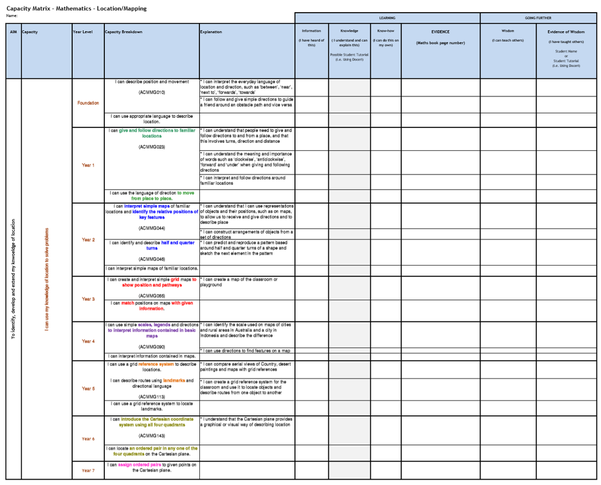 Curriculum Planning To Show Differentiation: Teachers can copy and paste the colour-coded curriculum into curriculum planners to plan and show differentiation (see an example here). Assessment: Teachers can eliminate Pre and Post Tests by using Progressive Capacity Matrices (see below). Online tutorials to explain and demonstrate how The Progressive Curriculum Frameworks can be used in myriad of ways mention above can be accessed from here. The Progressive Curriculum Frameworks for the Australian Curriculum can be downloaded further below. Embracing the philosophy behind the QLA Capacity Matrices, educators can also use the content from The Progressive Curriculum Frameworks in the form of Progressive Capacity Matrices. These senior year level capacity matrices have been designed using the progression/differentiation colour-coding from The Progressive Curriculum Frameworks. Students can use The Progressive Capacity Matrices throughout the learning process to help them track their growth and learning or as an end of unit task (see video at 2:01) to find and state evidence that they have met the applicable standards, content descriptors and elaborations. They also have the opportunity to identify when they have taught someone (higher learning) and to identify avenues for filming student tutorials for their Interactive ePortfolios. Note: You can view/download enlarged/PDF originals the following documents by clicking on each image. In the Chance Progressive Capacity Matrix above (original) and below (student copy from book), year levels are not specifically stated but progression is denoted by colour. Different variations can be made to include or exclude year level labelling, statement elaborations, and/or the removal of curriculum jargon; stating progression in plain form using the leading statement of, "I can". 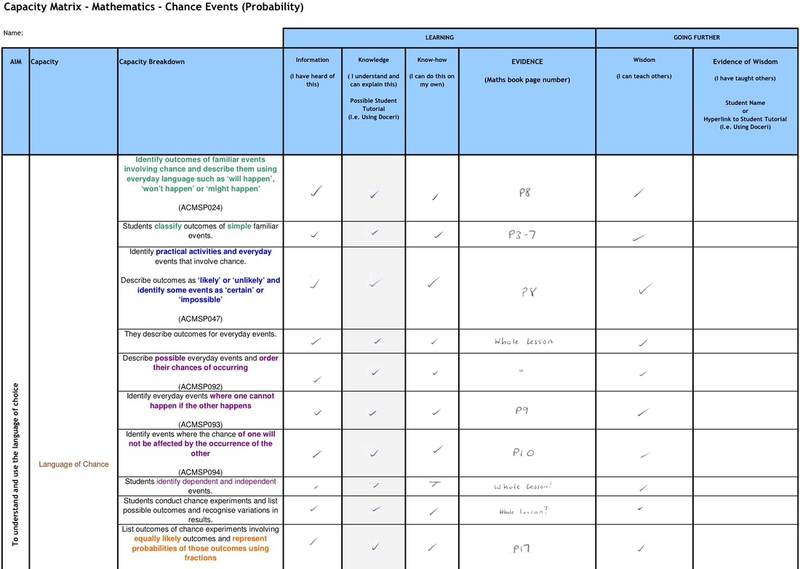 The Progressive Capacity Matrices can also be used in conjunction with the following sample (AusVELS) unit planner to track student progress through either student or teacher-allocated tasks. Select/click on the image below or download from here in two formats (.pdf .xlsx). Click here to download the various adaptations of the Progressive Capacity Matrices, downloadable in both .pdf (for viewing and use by students) and .xlsx (for modification). the frameworks (right-click to save). Excel: For educators who wish to work directly on a computer to hyperlink, highlight, annotate or copy the coloured content into planning documents (email Effective Curriculum Ideas for the Excel files). The original Australian Curriculum documents can be viewed and downloaded from the ACARA website or via The Australian Curriculum iOS app. NOTE: THE DOCUMENTS BELOW DO NOT APPLY TO WESTERN AUSTRALIAN SCHOOLS. THE SCSA IS ADAPTING THE CONTENT IN THESE LEARNING AREAS TO SUIT THE NEEDS OF WESTERN AUSTRALIAN STUDENTS AND SCHOOLS. Australian Curriculum - Progressive Framework - Digital Technologies - Strands with Elaborations (F-8): 2015 (v7.2)* - Hyperlinks to lesson content coming soon. Click on the links below to view the current PDF (or right-click to save) and Excel versions of The Progressive Capacity Matrices. NOTE: It is recommended for printing purposes to print these in A4 colour. Time - Progressive Capacity Matrix - Year Levels Identified (.pdf .xlsx). 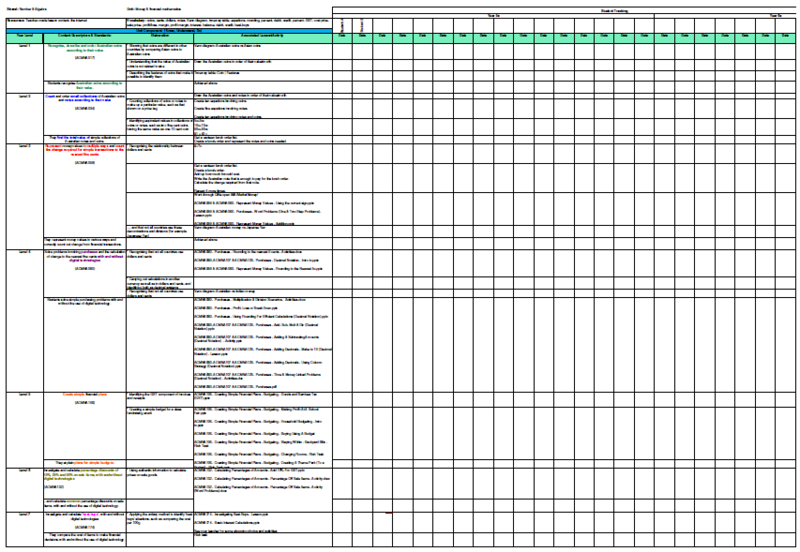 Autobiography Genre - Capacity Matrix (.pdf .xlsx). TeachingACEnglish - A resource created by Educational Services Australia to teach differentiation and explicit teaching of the Australian Curriculum: English. Australian Curriculum Lessons - A user-submitted site designed for educators in Australia where teachers can get paid to post their lessons so that other teachers can get ideas and lessons to use in the classroom. The site’s owner and developer is Scott McGlynn, a teacher at Buninyong Primary School in Victoria.